1 What is a Ganglion Cyst? Ganglion cyst or a bible cyst is a rounded lump, which is generally present on a muscle tendon near a joint. It is typically noticed as a slow growing or static swelling, which is painless and does not cause any functional restriction. Historically, ganglion cysts were treated by hitting them with a bible, and hence the name, “bible cyst“. Except the unsightly appearance, ganglion cysts are completely harmless and have absolutely no propensity of becoming cancerous. A neurofibroma is a similar lump occurring on nerves and has been known for cancerous transformation. Hence, it is very important to know whether one has a ganglion cyst or a neurofibroma. Ganglion cysts are filled with fluid which is quite similar to the synovial fluid of a joint. Though an absolute causal relation has not been established, yet many ganglion cysts are thought to arise from the joint capsule. Friction between a joint and the overlying tendons may have a major role in causing ganglion cysts. Ganglion cysts on wrist joint are exceedingly common. Ganglion cyst in wrist are located on the back of the wrist above the wrist bones scaphoid and lunate and are called dorsal ganglion cysts. Ganglion cysts on the front of wrist are called volar ganglion cysts. The size of a ganglion cyst in wrist may vary from a pea to a small lemon, but sometimes it can be large enough to cover the entire wrist. 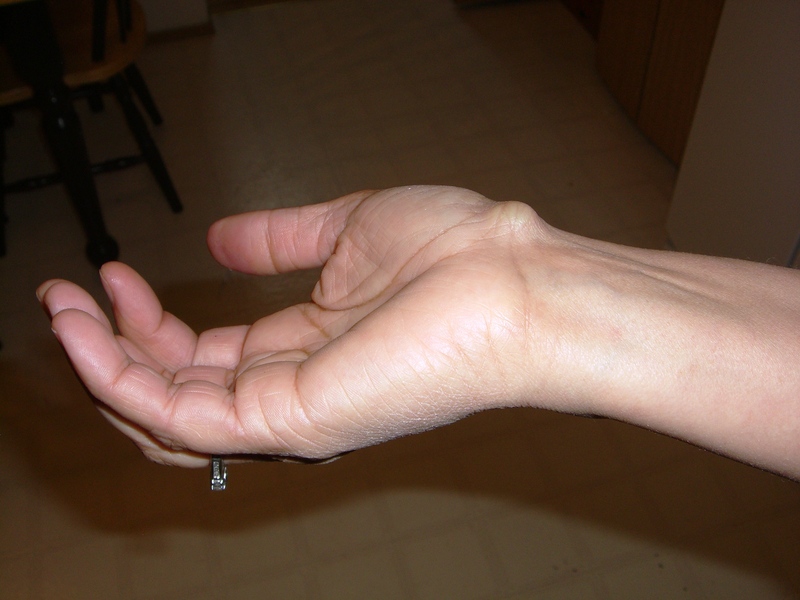 Larger ganglion cysts, though quite rare, tend to restrict wrist motion to some extent. Many people with concurrent carpal tunnel syndrome or other ailments tend to wrongly attribute the ganglion cyst in wrist as a cause of their pain. But, it is a misconception, as ganglion cysts are never painful. Similar to wrist, a ganglion cyst in finger is present near the first or second inter-phalengeal joint on the outer aspect. Even a small ganglion cyst in finger or a ganglion cyst in thumb can lead to a faulty grip or inability to fluently use the hand. Longstanding ganglion cyst in finger can cause a permanent finger deformity. Hence, such ganglion cysts should be promptly removed. The most common site for a ganglion cyst in foot is just below and in front of the ankle. Ganglion cysts in toe can be particularly problematic for wearing shoes or sandals with a pointed tip. This is the place where several small ankle bones, joints, and tendons, are present, making it a highly dynamic area of the foot. They frequently remain unnoticed or are discovered incidentally during foot examination for some other reason. Sometimes an increase in the size of a ganglion cyst in foot makes wearing of shoes difficult or even painful. It was earlier thought that, “Baker’s cyst” presenting on the back of knee, is a type of ganglion cyst in knee. Also a number of similar affections of the knee arise due to inflammation and infection of bursa’s around the knee. However, these are distinctly different than a ganglion cyst and should not be confused with it. Firstly, there is nothing like ganglion cyst home treatment, because it requires surgical treatment, and that too after a through evaluation by an orthopedic or general surgeon. During initial visit to a surgeon, investigations, like Ultrasound (USG), X-ray, and routine blood counts, would be done to confirm the diagnosis, and is an important step in treating a ganglion cyst. If it is not causing any specific symptoms, like pain or restricted movement, a ganglion cyst should be left alone. Conservative methods like aspiration of ganglion cyst or needling followed by hyaluronidase therapy may be tried. This is especially important for volar ganglion of wrist, which is many times almost embedded to important wrist blood vessels. Removal of ganglion cyst in this area can cause an injury to blood vessels and compromise the bloody supply of the entire hand ! Normally, a ganglion cyst excision surgery is a simple procedure, as the ganglion cyst is generally not too deep. But the close proximity of blood vessels and tendons always leaves the possibility of complications and potentially grave outcomes. Hence, surgery for ganglion cyst excision should be performed by an experienced surgeon of the area in which the ganglion cyst is present. Removal of ganglion cyst in its entirety should be ensured, as breaking of the ganglion cyst during removal causes some of its parts to remain inside the body, and are prone to recurrence. Arthroscopic ganglion cyst excision is the latest trend in treatment of ganglion cyst. It involves passing an optic fiber through a small incision, which helps proper visualization of the cyst and careful removal through a smaller second incision. This not only ensures complete removal of the intact ganglion cyst, but also helps in early healing of the surgical wound and preventing recurrence. my son has got a similar lump in his shoulder, can ganglion cyst occur in should as well? or is it something different? Generally ganglions are uncommon in shoulder.. It must be a lipoma mostly. Are their any ganglion cysts homeopathy remedies which can be used instead of going for a surgery? Not in my knowledge. It has to be removed surgically or else left alone. I was reading some articles on the internet about ganglion cyst and its removal. I came across one such article which mentioned that bee venom can reduce ganglion cyst. I am not sure whether its right. Please throw some light on this. Such measures are not effective on a long term basis cause there is a high chance of recurrence. And one never knows what damage the venom might cause on other parts of the body. So kindly beware. @dr gauresh – my husband has got a ganglion cyst in his wrist and looks almost the same as the image you have provided in the article. He is not too keen on having a surgery though, would this create any complications if we leave that untreated? what is the cost of ganglion cyst removal surgery? Also what sort of recovery time is there after the surgery? Would i be able to go to work within 1-2 days? Mostly it is fine to leave it alone. Unless it starts paining or rapidly increasing in size. The cost depends on the hospital that you visit. Its also based on the surgeon you consult. These factors vary quite a lot from region to region so I cant comment on the cost. After surgery its a small dressing that you have to keep for 7 days until suture removal. Mostly one can go to work on the next day itself so that shouldnt be a problem. I have an Intraosseous ganglion cysts in my Lunate bone, the dr removed and did a bone transplant. But the bone never healed after nearly 3 years. Now I have another cyst in another bone in my wrist. The dr said this would not spread. My wrist is now very painfull. How do I know this will not spread any further, if not already. And may I loose the use of my wrist? I have a ganglia that broke open and is draining. Any suggestions? I’ve had my cyst on the top of my wrist. 6th months ago I had it aspirated and it came back more painful than ever. I can’t even move my wrist without being in pain. My parents and I are considering surgery. I’m the type of person that stresses everything so I’m worried about what could go wrong while in surgery. Please respond. I am a professional golfer/instructor and I have a ganglion on the underside of my wrist and sometimes it cause a tinge in my golf swing. I can’t afford to not swing a club for week after week and I am afraid that is what surgery is going to cause. What would you suggest? Maybe splinting it when I am not swinging a golf club??? I have a ganglion cyst on the back of my thumb. i saw the doctor the other day and he said i need surgery. i didnt get to discuss with him how long it takes to heal? does anyone know? I’ve had 3 surgeries and now have my 5th ganglion cyst on the top of my left foot. In my last surgery, the tendons in the area where the cysts keep appearing were burned down to supposedly create enough scarring that it was supposed to suppress them from developing again. So what’s the next step? I have taken care of two ganglion cysts in about 10 years. I smacked them with a wooden spoon. It is immediately broken and gone, done, kaput, adios cyst! These cysts were also called “Baker’s cysts” in the “old” days! Forget the surgery! I have had two removed surgically, no return, and one drained and given cortisone, which has returned and is painfull because it is on the thumb joint which I use everyday in my job. I am hoping to have it removed surgically. I also have one on my wrist below the thumb area, this one never hurts and causes me no grief except when people notice it and question about it. I have been told when my other two were removed surgically that the surgeon did not want to touch it as there were too many arteries close to it. Is there something perhaps in ones diet that would cause these to keep forming? I had a ganglion cyst removed from the top of my wrist. It has only been 9 days but I can not move my thumb. I am really upset because I am afraid that something went wrong in the surgery. Please help me out if anyone knows anything about that. I have a doral ganglion cyst on my right hand but it kinda small but sometimes painfull … sometimes it gets smaller and increase its size but it never grows bigger then it was .. what do you thing I should do ?? Should I get a surgrey done for I could use my right hand better && it won’t mess me up in school?? hi, i am moha gago in somalia,to my point of view, it has to be removed surgically. I have a cyst on my foot, and its been there since i was a little kid. Do I have to get surgery? I too had a ganglion on top of my finger. I hit it with a wooden spoon and it was gone. No surgery for me!! I changed my diet radically to reduce acidity – bingo, they all went away. Now I maintain a Ph negative regime in what I put in my mouth.